There was a bit of a slow start to this one with neither team appearing to be especially sharp in the opening minutes. The Spruce Kings would get the opening powerplay just short of the midway point, but it was the Bulldogs who had the best chances as both Mitch Makin and Zak Bowles couldn't cash in on a Spruce Kings turn over as the game stayed 0-0 into the Media Timeout with 9:38 left in the first period and the shots just 4-4. The Spruce Kings would open the scoring shortly afterwards on a play that didn't look like much, as the puck was fought back to the right point where Adam Clements moved in and put a quick wrister on goal that was perfectly placed, just under the cross-bar top corner short-side over the glove of Warren. Assists on the play went to Braiden Epp and Rider Stoglin at 12:10 of the first for a 1-0 Spruce Kings lead after one period, with Prince George up 7-6 in shots. The Dogs got an early power play in the second but again failed to capitalize. They received a second powerplay shortly afterwards, and this would seethe game change dramatically as Mitch Makin drove the net and missed a pass and contacted the Spruce Kings goalie. He would be immediately challenged by Ryan Fritz, and Makin answered the call and dropped his gloves, with the fight (if you could call it that) ending relatively quickly. It was too quick for Fritz's liking, as he threw a punch at a defenceless Makin who was on his back on the ice. The referee would detect it, and give both players 5 for fighting and a match penalty to Fritz for the late cheap one. The Bulldogs would connect on the ensuing 4 on 3 power play when Josh Adkins found Kurt Gosselin at the top of the point where he walked in and blew a low slapper past the stick side of Brooks-Potts to make it 1-1 at 6:48 of the second. The Dogs kept up the pressure and took a 2-1 lead on the Major Penalty when a crazy scramble saw the puck come back to the left circle to Brett Stewart, who out-waited the goalie before putting a wrister glove side off the post and in to make it 1-1 at 9:57 with Drew Blackmun drawing the only assist. It was 3-1 Dogs two minutes and change later after two highlight reel saves by Brooks-Potts saw the puck kept in at the right point by Drew Weich. He went D-to-D to Jeff Rose who put a quick shot on goal that was stopped. Dylan Haugen would put the rebound on net out of mid-air, which was again stopped, but it came back and hit Haugen and bounced just over the line to make it 3-1 Dogs at 12:25 with Everett Putz picking up the only assist. Shots favoured the Dogs 13-8 in the period, for a 19-15 advantage after two. The Bulldogs would really push the pace in the third period, not sitting back on the lead as they continued to show great urgency as they out shot the Spruce Kings 7-1 in the early stages of the period, and continued to hold a 10-4 lead in shots in the period when the game was stopped for a long delay due to a glass problem with 8:25 left in the period with the Dogs still up 3-1. The dogs came out of the delay and continued to carry the better of the play, but the Spruce Kings pushed and made it 3-2 with 2:56 to play when Cooper Leich roofed a loose puck in the slot with Brogan O'Brien drawing the assist. In the final minute the Dogs got dinged for icing and were unable to clear the puck and it came back to bite them as Rider Stoglin fired a wrister past the blocker of Warren from the slot to make it 3-3 with 56 seconds to play with Jale LeBrun drawing the only assist. Instead of getting it to overtime, the Dogs would win it outright when Everett Putz roofed a centering pass from the crease with 22 seconds to play for the 4-3 final. No assist was given on the play but I thought it might have been Justin Marreck who put it out front. Final shots favoured the Dogs 37-26 with Nathan Warren picking up the win whole Alex Brooks-Potts took the loss. 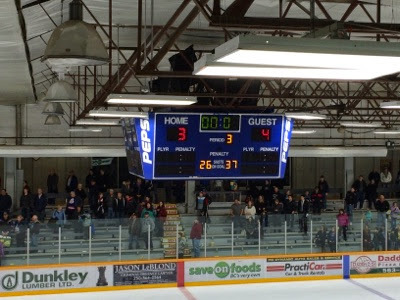 The Dogs went 2 for 5 on the power play while the Spruce Kings went 0 for 4. The Dogs travel overnight to the Lower Mainland to visit the Eagles in Surrey tomorrow night.